Labor Secretary Hilda Solis will not return in President Barack Obama's second term, the White House confirmed Wednesday. Solis, formerly a California congresswoman, said she made the decision to step down from her role over the holiday season. 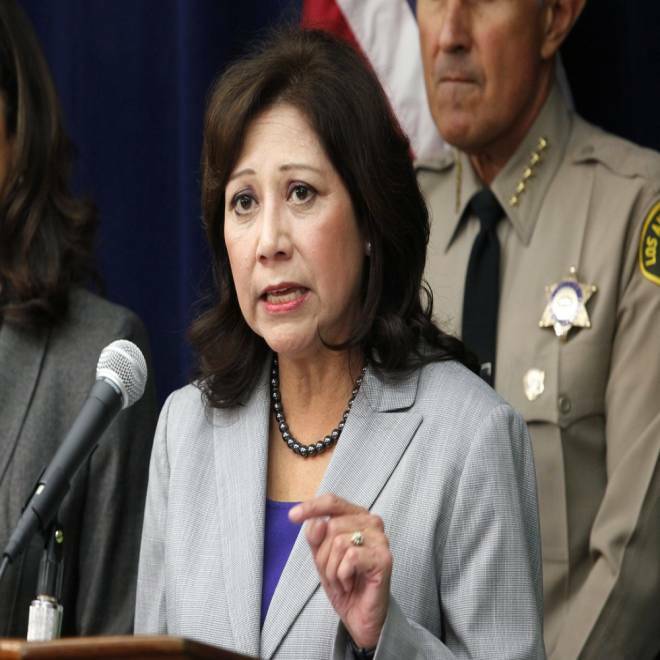 Flanked by California Attorney General Kamala Harris, left, and Los Angeles County Sheriff Lee Baca, right, U.S. Secretary of Labor Hilda Solis talks during a news conference at a symposium on human trafficking on Friday Nov. 16,2012 in Los Angeles. "Over the Christmas and New Year holidays with my family in California, I enjoyed my first opportunity in years to reflect on the past and my future, with an open mind and an open heart," she said in a statement. "After much discussion with family and close friends, I have decided to begin a new future, and return to the people and places I love and that have inspired and shaped my life." Many Cabinet officials chose to stay on for only one presidential term, although a White House official confirms to NBC News that the heads of the Health and Human Services, Veterans Affairs and Justice Departments will remain in their current posts. In a statement, Obama called Solis "a tireless champion for working families." "Over the last four years, Secretary Solis has been a critical member of my economic team as we have worked to recover from the worst economic downturn since the Great Depression and strengthen the economy for the middle class," he said. "Her efforts have helped train workers for the jobs of the future, protect workers’ health and safety and put millions of Americans back to work." The vacancy sets up the absence of yet another female member of Obama's cabinet. The administration has come under pressure to consider gender and racial diversity after recently appointing white men to top posts at the Defense, Treasury and State Departments.